By Allan Fox: Former middleweight world champion Peter “Kid Chocolate” Quillin (32-1-1, 23 KOs) will be returning to the ring next month on September 8 in a 10 round scheduled fight against an opponent still to be determined at 170 pound maximum limit at the Hard Rock Hotel and Casino in Las Vegas, Nevada. For Quillin’s sake, his management needs to be careful in the opponent they put in with him. He’s been out of the ring for so long in the last 3 years. He’s missed a considerable amount of time with 2 separate long periods of inactivity. You have to wonder whether Quillin still likes to fight. Quillin has decided to fight in the super middleweight division. It’s a logical move for the 5’11” Quillin, considering that 22 of his 34 fights during his career have taken place at super middleweight. He might as well move up to 168. You can say the same thing about Danny Jacobs, the last guy Quillin. He should think about moving up too. The 34-year-old Quillin hasn’t fought in close 2 years since his 1st round knockout loss at the hands of Daniel Jacobs on December 5, 2015. That was 21 months ago. Quillin has been out of action, watching the middleweight division being ruled by Gennady “GGG” Golovkin with an iron fist. Quillin’s conqueror Jacobs tried and failed to beat Golovkin. Quillin has looked kind of soft around the middle in his time out of the ring. With the weight at 170 for his September 8 fight, hopefully Quillin won’t wined up draining himself trying to make that weight. It might be disastrous for Quillin’s boxing career if he gets knocked out by the tune-up opponent that is brought in for him to fight. You don’t know what you’re going to get from Quillin after 2 years out of the ring. It obviously wasn’t a smart move on Quillin’s part to stay out of the ring for the last 2 years. Quillin had already previously taken 1 year off from the ring after his win over Lucas Konecny on April 19, 2014. Quillin was the WBO World middleweight champion at the time. The World Boxing Organization ordered Quillin to face #1 WBO mandatory challenger Matt Korobov. Instead, Quillin vacated his WBO 160-lb. title and stayed out of the ring for 12 months. For a professional athlete to throw away a year of his career is not a good thing. But, Quillin has now thrown way another 2 years of his career with his latest absence from the ring. In the last 3 years, Quillin has fought exactly 3 times. That’s terrible. If you want to stay sharp, you’re not going to do that by fighting just 3 times in 3 years. Quillin has arguably become a part time fighter at this point in his career. I don’t know what Quillin expects to accomplish when he does return to the ring. The only thing you can hope for is Quillin doesn’t disappear for another year or more to sit outside of the ring. Well, you can’t blame boxing fans for thinking that Quillin has retired. When you’ve been out of the ring for as long as Quillin has in the last 3 years, you can’t help but to think the guy is retired. It’s going to be next to impossible for Quillin to regain the form that he once had during the best years of his career from 2010 to 2014. Quillin was a good fighter when he was active and fighting a lot. But after he took a year off from boxing from 2014 to 2015, he didn’t look nearly as good when he returned to the ring on April 11, 2015 in a fight against Andy Lee. Quillin knocked Lee down twice in putting him down in rounds 1 and 3. Lee then came on and dropped Quillin in round 7 and dominated the entire second half of the fight to salvage a draw. Quillin was very lucky that he scored the 2 knockdowns early, because Lee would have easily have won that fight. Would Quillin have struggled against Lee if he’d stayed in the ring and continued to stay sharp? I doubt it. Quillin would have likely done a number on Lee, knocking him out and looking sensational. But the year off from boxing really hurt Quillin’s skills. His power was still there, as we saw in the first 3 rounds, but not his stamina or his defense. Quillin faded quickly and was punished by Lee’s right hook repeatedly in the last 7 rounds of the fight. Quillin’s 1st round knockout loss to Danny Jacobs in December 2015 was a devastating affair for him, as he was knocked out in just 85 seconds. Quillin started to exchange shots with Jacobs, but he got nailed by a hard right hand to the head. Jacobs then flurried on the badly hurt Quillin until referee Harvey Dock stepped in and halted the fight at 1:25 of round 1. It’s a good thing that the referee did stop the contest when he did, being that Jacobs was just getting warmed up and he wasn’t going to get tired of hitting the defenseless Quillin with shots to the head. Something had to give. Either the fight was going to be stopped with Quillin on his feet or he was going to get knocked out in the clinical sense by Jacobs. Dock likely thought about Quillin’s health in stepping in and stopping it quickly when it was clear that he was too hurt to continue fighting. At this point, Quillin should put Jacobs completely out of his mind. That ship has sailed. Jacobs blasted Quillin out, and he’s moved onwards and upwards since then. Jacobs wants bigger fights than facing a guy that is arguably semi-retired and trying to make a comeback at 168. Jacobs is still complaining about his loss to Golovkin, and saying how he wants to fight the winner of the Golovkin vs. Saul Canelo Alvarez fight on September 16. Jacobs probably isn’t going to get the winner of that fight, but it shows you where his focus is at right now. Jacobs doesn’t need to take his boxing career backwards in fighting a guy that has been sitting on the shelf for the last 2 years of his career. That would strange move for Jacobs if he did that. He already wasted time fighting past his best fighter Sergio Mora twice. Facing Mora twice was crazy. If Jacobs were to continue to keep fighting guys that he already beat, he’ll use up his career and end up with nothing to show for it. Quillin is now being trained by Virgil Hunter in Hayward, California. Hunter also trains light heavyweight champion Andre “SOG” Ward. Quillin was previously trained by Eric Brown. It’ll be interesting to see what Hunter can get out of Quillin. Hunter is a good trainer, but not everyone he trains gets positive results. You got to have a lot of talent to begin with. Hunter can work well for some guys, but I don’t think it’ll matters if Quillin keeps taking long breaks form boxing. Hunter isn’t going to be able to force Quillin to stay active. If Quillin decides in a couple of fights from now that he needs another 1 to 2 years rest break from boxing, then Hunter isn’t going to be able to do much with him. At this point, it’s imperative that Quillin stop taking long breaks from boxing and just stay in the gym. I doubt that he’ll be able to even get back to the form he was in for his knockout loss to Jacobs, which is sad because both of them would have likely lost to Golovkin on that night. Quillin’s September 8th fight will be on the undercard of the super middleweight clash between knockout artist David Benavidez and Ronald Gavril. Those 2 guys are fighting for the vacant WBC super middleweight title on Showtime World Championship Boxing. 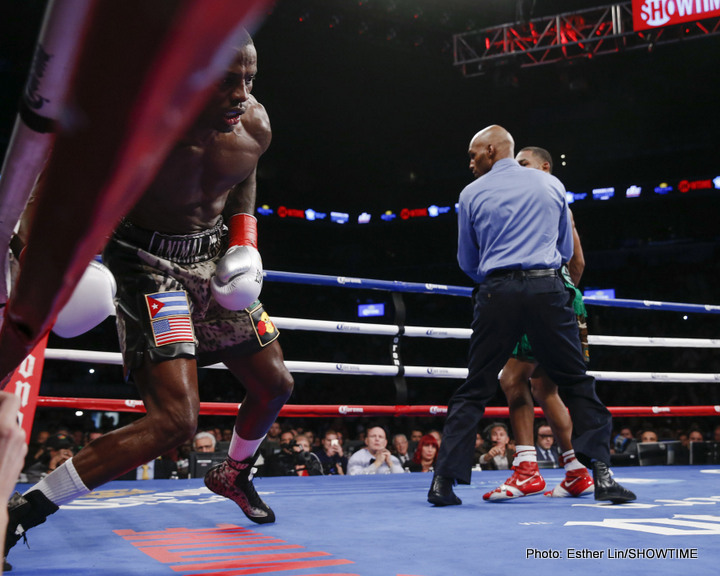 Quillin’s tune-up fight won’t make it on the televised portion of the Benavidez-Gavril card. The 22-year-old Benavidez was at one time a sparring partner for Quillin, and now look at him. Benavidez has done well mainly because he’s stayed in the gym, worked hard, and not taken long breaks from boxing the way that Quillin has been doing. It also doesn’t hurt that Benavidez has huge punching power, and a great of talent. Quillin would likely be well over his head if he fought Benavidez at super middleweight. It’ll be interesting to see if Quillin is able to turn his career around to the point where his fights are televised once again on Showtime instead of ending up on the non-televised portion of the cards. Quillin would likely need to take on a good opponent for him to get his fights televised. It’s going to be tough for Quillin to turn his boxing career around at his age, and with need for rest breaks. When Quillin’s career is over, hopefully he doesn’t second guess himself for having taken so much time off from boxing during the prime of his career. It’s hard to understand a fighter that toils away for years to try and become a world champion, and then vacates his WBO title and stays inactive for 1 year, and then he takes another 2 years off.